Ask fellow campers about "John Pennekamp Coral Reef State Park" and nearby attractions. Good state park. Sites wide enough but a little short. 35' class A backed all the way in and just enough room to park car paralle in front. Thick layer of pea gravel to park on. Drained really well during heavy rain. We were in site 14, which was directly across from bath house. Convienent if you need it, but not a good view. Campground doesn't have a separate tent area. On our last night, 4 campers with 2 tents were right next to us. We camped at John Pennekamp Coral Reef State Park in a Motorhome. 2 1/2 hour snorkling trip is a must do. Visitor center and aquarium were very informative. Sites are very tight but deep. My neighbors sewer hookup was right by my door-ugh! I was unable to extend my awning. Lots to do and see at the park and shopping, good restaurants are close by. This campground is great for a base camp for all the activities but not for the "camping experience". We camped at John Pennekamp Coral Reef State Park in a Travel Trailer. We stayed for a week in early July. Sites were a little tight but clean. My only issue with the campground is the traffic in the park and the garbage pick up was accomplished at 6AM most mornings. This was LOUD and woke me most mornings. We camped at John Pennekamp Coral Reef State Park in a Travel Trailer. Scuba trip from the park was Great! We read the reviews, did our research and we thought we knew what to expect. We were still disappointed. As everyone else has mentioned, the sites are VERY close together with no privacy and almost no outside sitting area. The hookups are strange with electric and sewer being on the "correct" side, but our site shared the water hookup with the neighbor on the opposite side. The land area of the park is very small, so there is limited walking in the park, and if you go outside the park, you have lots of traffic to contend with. To make things worse, the two weeks we were there, the no-see-ums were so bad, we couldn't even sit outside. There are dog friendly beaches nearby, but are currently closed due to Irma. There are a couple of short nature trails which are cool, the boat tours are worth the price, and the kayaking is ok, but that's about it for the good. We camped at John Pennekamp Coral Reef State Park in a Motorhome. OK place to camp, but the sites are extremely small. We did not set up our sewer as it was just a few feet from the neighbor's picnic table. The park is extremely busy, so hospitality seems pretty non-existent. However, if you are there to snorkel, use the beach, take tours, etc it is very convenient. The store is not very well-equipped for campers, but the Publix and Winn Dixie stores are very close. I liked that there was coded entry for the campground, however the 6am trash pickup was pretty ridiculous. For the price, and for one of the coveted Keys campsites, it's not bad. The Park is just a bit crazy-busy for my tastes. We camped at John Pennekamp Coral Reef State Park in a Travel Trailer. Great place to kayak, paid boat rides to snorkel, glass bottom etc. Nice beach, very tight quarters, neighbors sewer almost under your awning, super electric and water although H2o pressure lackluster. 102 miles to key west (3 hours), campground hosts seem nonexistent. We camped at John Pennekamp Coral Reef State Park in a Motorhome. Key largo has it all. Great price for the Keys. Sites way too tight. Sewer hookup half way up the site in the face of your neighbor. Lots of no-see-em's. Trash dumpster pickup twice a week at 6AM (lots of noise). Staff very friendly. We camped at John Pennekamp Coral Reef State Park in a Motorhome. Nice! The very best part was seeing colorful iguanas in the swamp! 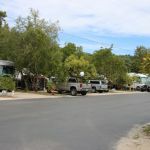 Sites were close together but the friendly people and great amenities made everything ok. We camped at John Pennekamp Coral Reef State Park in a Motorhome. Stayed here a couple of nights and enjoyed our stay. Had a few OTA tv channels and decent Verizon service. The campground and facilities were very nice including the visitor's Center and aquarium. Sites are quite close together, apologized to our neighbors for hooking up sewer hose while they were sitting at their picnic table nearby. Bugs weren't bad given the proximity of water. We would stay here again if in the area. We camped at John Pennekamp Coral Reef State Park in a Travel Trailer. Campgrounds in the Keys are pricey, so snagging a site in a state park is like winning the lottery. John Pennekamp Coral Reef SP is VERY busy with a near constant coming and going of campers. The sites are full hookups. Sites are close with vegetation between them and to the rear. The park staff provides nature walks. The visitor center has a small aquarium that is a nice surprise. While there are some trails to walk among the mangroves, this park has a lot of concrete and pavement. While I'm glad I stayed there, I will search for other parks in south Florida that offer more space and give a me a feeling of being in nature rather than such an urban environment. We camped at John Pennekamp Coral Reef State Park in a Motorhome. Beautiful state park with lots of outdoor activities. Short walk to kayak launch on Largo Sound with mangrove trails and access to the ocean. Swimming and snorkeling a slightly longer walk away. On the down side, campsites are fairly narrow with minimal screening between sites. It's Florida's most popular state park so expect a LOT of day-use people, especially on weekends. We camped at John Pennekamp Coral Reef State Park in a Motorhome. Key Largo Fisheries has fresh seafood to go, and they sell prepared seafood to eat on their picnic tables overlooking the marina. The camping sites are very close with no views. The park is very busy with boaters, folks going on snorkleing and diving tours. There is a glass bottom boat tour which we took but the ocean was rough the day we went out and we saw very little on the tour. We had spent the previous three nights at Bahia Honda State Park in the lower keys and this park was a bit of a let down after visiting such a jewel park. We camped at John Pennekamp Coral Reef State Park in a Motorhome. Good places to eat near the park. Highly recommend The Conch House and The Fish House. After a month of staying in sterile private campgrounds in Florida, checking into a State Park was a welcome relief. We obtained our reservation via a cancellation and had to move mid-stay to a different site. Yes, the campsites are a bit narrow, mainly because there is vegetation growing between campsites. This allows for separation between sites and privacy, something seriously lacking in the private campgrounds. The entry road was paved and wide, and there was a coded-entry gate to the campground as well as at the park entrance for after hours. The sites are full hookup--electric/water/sewer. We were able to receive DISH reception on Site #9 but not #19. Many satellites around us were positioned in very creative locations. Not sure how many channels would be available via antenna. The main bath was clean and recently remodeled. There were 2 washers and 2 dryers located just outside the bath house. The smaller bath at the end of the road was old and felt tight. With the small size of this campground, it surprised us to see two bathhouses. We rented kayaks at the park and paddled around in the mangroves. Other campers were very friendly, and we thoroughly enjoyed our stay here. We will definitely return. We camped at John Pennekamp Coral Reef State Park in a Motorhome. We also took the glass bottom boat trip to a coral reef which was a great trip. The Aquarium in the Visitor Center was very nice (my fish pictures taken there turned out better than those on the boat trip). The boardwalk to the viewing tower is still closed, but other infrastructure at the park looked in good repair. Sites are fairly level and a mix of gravel,weeds and grass. Hookups are in the correct place, however, whenever I dumped, it would run out of the sewer unless I barely opened the valve. Sites are very tight with most not having enough room for an awning. We camped at John Pennekamp Coral Reef State Park in a Motorhome. The last time we stayed here was 2007. There has been some updates in the campground like sewer connections and 50 amp but this was the only thing that kept me from rating lower than a 5. The rest of the park is falling apart though. The aquarium was closed. The beaches are in need of work at both Cannon beach and Far beach. The wooden bridge to Far Beach looked like it was about to fall into the bay. The boardwalks and observation tower were closed due to disrepair. Loud music after quiet time was not uncommon and not a park employee in site to address this. The smaller bathhouse in the campground needs updating. We will not return and its sad because this place has so much potential. We camped at John Pennekamp Coral Reef State Park in a Travel Trailer. Are you affiliated with John Pennekamp Coral Reef State Park ?